Today I made another card using my new punches (giant daisy, small sun) from Punch Bunch. I'm having a lot of fun with these two punches and can't wait for my other order to arrive! This time I made them into Coneflowers (Echinacea). I punched the flowers from Pink Pirouette cardstock (pale pink) and then sponged around the edges with a more intense pink to give them interest and depth. I used the sun punch for the centers of the flowers (like the card I made yeserday), only this time I didn't cut the sun rays in half, instead I sponged the edges of the Soft Suede suns with Early Espresso. This gave the centers a more realistic look by having the two tones of brown. Hope you like. nine suns for the large flower center; four for each of the small flowers, punched in Soft Suede cardstock, edges sponged with Early Espresso ink and then shaped. I made a card base from Crumb Cake cardstock and then ran it through my Big Shot with the largest nestie from the Labels Two set, making sure the top of the card (fold) was above the cut line. I cut out another large Labels Two to use as my card front. I stamped the front with En Francais which has been inked with Soft Suede, and stamped off once to created a faded look. I sponged all the edges with more Soft Suede ink to give it an aged look. I cut out the flourish die from Soft Suede cardstock and sponged with more of the same color. I glued the die to the front of the card, making sure the flourish went past the edge of the card for interest. I glued the flowers on top. I added one leaf branch from the flourish to the inside of the card. Yesterday, Nancy asked that I include a picture of my sun punch that I used for the center of the flowers. I bought the small sun, which measures just over 1/2" wide (punches come in five sizes ---giant / mega, large, medium, small, mini). The one on the left is how the sun is when it is first punched. When making the center for the white daisy on yesterday's card, I cut each ray of the sun in half before shaping and making it into a cone shape - this made the center more "prickley" (middle sun). For the centers on today's flowers, I punched the suns but did not cut the rays, instead I sponged a darker color around the outside edges before shaping. Labels: all occasion, CAS, CAS mixed media, cheery lynn, punch, shaping, spellbinders, Stampin' Up! Another fabulous card. Gread job. Mmmm, no, not a card, can't be. I think it is metal art, a stunning sculpture. Absolutely stunning coneflowers Loll. TFS the pic of the punched suns. Now I can visualize how you did the centers of your flowers. I am thinking of trying the effect on a 1" and maybe on a 3/4" circle. I will share what might work. 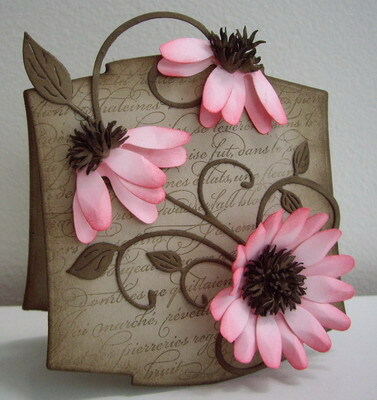 Love the shading on those petals - this card is gorgeous! This is a beautiful card. Love how you did the flowers and the centers are terrific. LOVE THIS! Beautiful. One of my favorite flowers too! My favorite flower. Just perfect . TFS. Stunning card! I must say this is the most beautiful card I have ever seen! Great job! This is beautiful, too. I love the dimension you get with your flowers. I have some of those McGill flower punches, but need to try the same techniques with some other shapes and dies. Really enjoying your blog! On the Giant Daisy punch a bunch die is it the super giant or the mega giant that you used? I can't seem to find a listing for just "Giant Daisy Punch"